Long-term gain rarely comes without short-term pain. 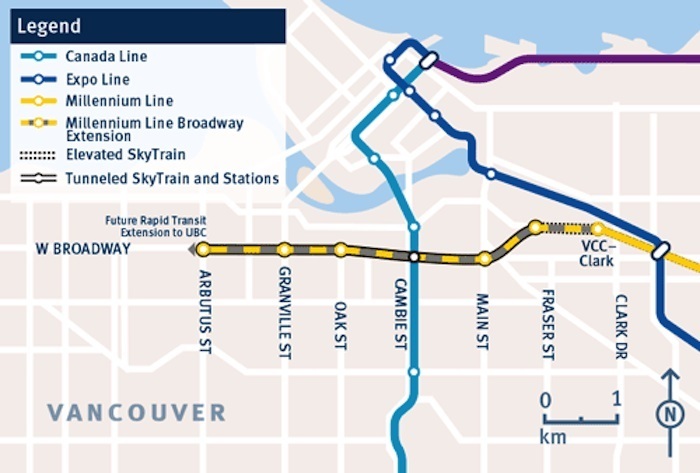 The provincial government has provided an outline of the first construction project related to the Millennium Line’s 5.7-km-long Broadway Extension from VCC-Clark Station to Arbutus Street, and some of the corresponding planned reroutes of trolley bus routes to accommodate subway construction starting in 2020. 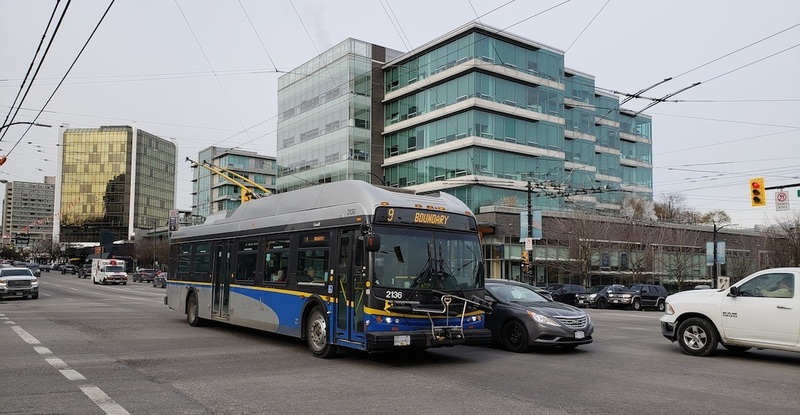 In an email to Daily Hive, the BC Ministry of Transportation and Infrastructure confirmed that bus routes No. 14 (Hastings/UBC), No. 16 (29th Avenue/Arbutus), and No. 17 (Oak/Downtown) will run along some segments of West 12th Avenue, Macdonald Street, and Cambie Street instead of their current routes on West Broadway. To make these reroutes possible, a 16-month-long, early-work construction project will begin next week to alter the trolley power lines in the area of the Central Broadway Corridor. According to the Ministry, this early work project involves the installation of about 300 trolley poles and foundations. Construction is scheduled to occur mainly on weekdays from 7 am to 6 pm, with some occasional work during the weekend. “There will be no disruption or change to transit service throughout the early work program and minimal disruption to pedestrians, cyclists and vehicle traffic is expected,” said the Ministry. There may be some temporary street parking restrictions and occasional lane closures during this trolley infrastructure work. While the entire tunnel route will be bored, localized cut-and-cover construction is still required at West Broadway’s major intersections of Main Street, Cambie Street, Oak Street, Granville Street, and Arbutus Street to complete the new underground stations. Altogether, the planned disruptions will be significantly less than what was experienced on the Cambie Corridor for the Canada Line. More details on the design of the Broadway Extension should be made available in the coming weeks and months, just as the project heads into its private contractor bidding phase. Construction on the $2.8-billion project is expected to reach completion in 2025. The provincial government is overseeing the entire construction project and will handover the extension to TransLink when it is finished.